Your mileage may vary, but for this horror fan, filmmakers making a sincere effort to deliver a fun, nostalgic slasher pic on a shoestring budget deserve points for effort, even if the results are uneven. An effort that fits that description is Billy Club, which had its world premiere during the Milwaukee Film Festival. Its raw and flawed and feels like the work of young filmmakers, but it shows promise and has enough going for it to merit viewing. In 1996, Bobby Spooner (Marshall Caswell) returns to his small Wisconsin hometown after many years away. He quickly hooks up with childhood friends Allison (Erin Hammond), Kyle (Nick Sommer), and Danny (Max Williamson). As kids they played on the same Little League team 15 years prior. After tormenting teammate Billy Haskins for striking out to end a big game, young Billy took revenge by savagely killing two players and the coach. His actions landed him in a mental institution. Following Bobbys unexpected return, the foursome decides to commemorate the tragic event of 1981 and pay tribute to the deceased by visiting the coachs old cabin. Meanwhile, someone dressed in an old umpires uniform, including an antique mask, is using a modified baseball bat to kill the surviving players from that team. The instrument of death is a pretty cool one, with nails protruding from the end and a large retractable blade. Of course, the killer will eventually find their way to the coachs cabin, ready to make sure there are no more reunions for the team. Its a familiar but workable setup, one that is enhanced by the killers weapon and attire. Billy Club gets off to a good start. The killers introduction, as they create their unique bat and use it on a few hapless victims, kicks things off in promising fashion. It also ends well, with some really gruesome kills that put the bat to good use and feature solid effects work, including a scene that showcases a contraption that elevates all the killers victims out of a watery grave (making for a twisted graveyard of sorts). It is the midsection that is most problematic. There are some issues with the tone as the movie awkwardly mixes comedy with the horror, always tough to pull off effectively. The killer is off-screen for a very long time, and their absence is felt. The middle centers on the foursome and includes a lot of goofy humor, some of which is genuinely funny. But for long stretches its almost like were watching something from an entirely different genre. You cant help but hope for the killer to strike again. Despite this, along with writing that can be clunky and acting thats a little rough around the edges, Billy Club has its charms. Some of the kills are creative, there are clever visual touches (a man holding his mouth so the killer doesnt hear them breathe slides down a wall, revealing a poster of Uncle Sam holding a finger over his mouth), and it has a healthy sense of humor. Its far from perfect, but there is real talent on display. Billy Club is scheduled to screen at the Telluride Horror Show on October 11th and the Pollygrind Film Festival on October 13. 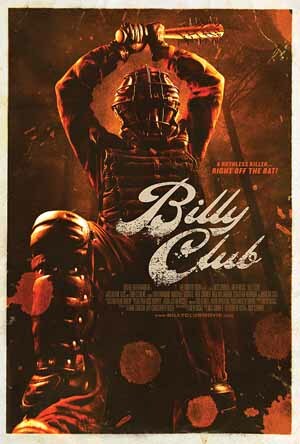 For more information visit www.billyclubmovie.com.